Simply slide the pulley onto the motor shaft and tighten the 10-32 set screw, using a 3/32 hex key. The pulleys are .40” inside the flanges to allow for belts up to 3/8” in width. 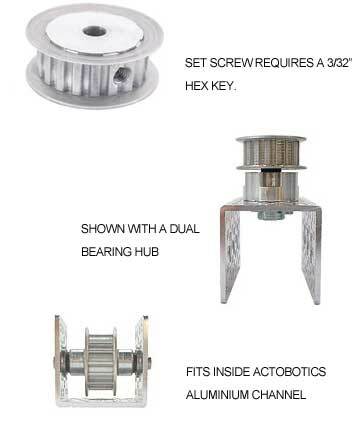 The 10 and 16 tooth pulleys are able to run inside of the aluminum Actobotics™ channel. The pulley can be used for building pan and tilt systems, camera sliders, XY tables, robotic drive mechanisms, etc. Constructed of 6061 T6 aluminum.